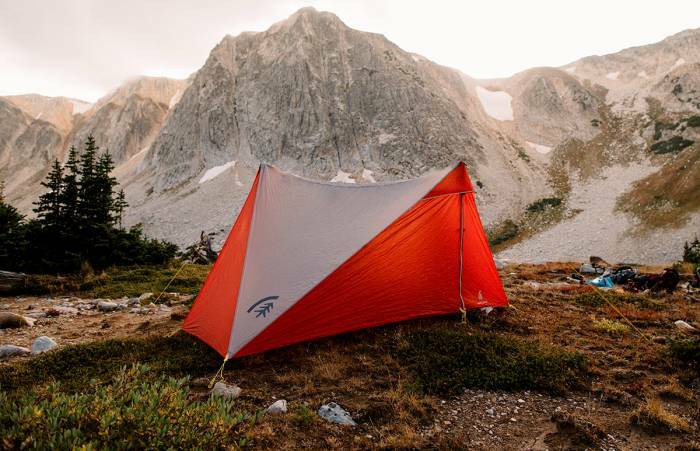 A versatile, modular design for solo campers or pairs, Sierra Designs’ High Route 1 FL has a removable mesh ‘nest’ and a minimum weight of just 22 ounces for the tarp alone. We got a first review. The sun just set over the Rockies, and light was fading fast. Andrew Skurka – a hiker who’s crossed the continent multiple times and even circumnavigated Alaska on foot – leads the way into a valley of pines. The temps are dropping and winds are picking up. Time to shelter for the night. Skurka gets to work, setting up a shelter system he designed for Sierra Designs while explaining its nuances. In about five minutes, we’d pulled the High Route 1 FL out of a pack, pegged out the corners, hoisted it over hiking poles, and strung it out taught. The light tent system was ready for the night. Time for my first test and review. 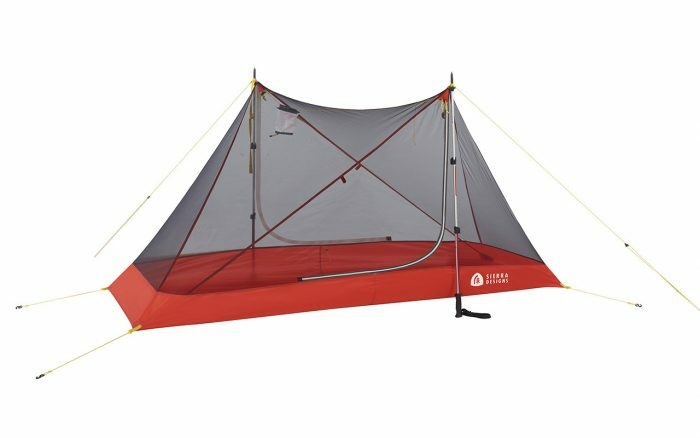 The High Route ($300) shelter comes in two pieces. First is a floor-less tent that erects with hiking poles. 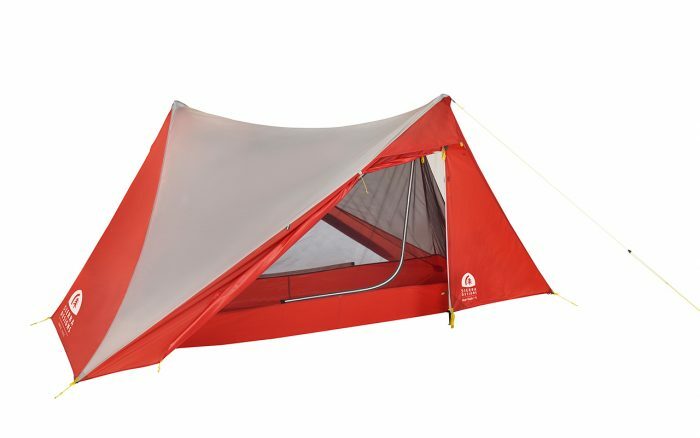 If bugs aren’t an issue, the minimal shelter weighs just 22 ounces and covers two hikers with backpacks/gear. The second part is an interior “nest,” which is made mostly of mesh and also has a floor. The nest suspends inside the outer tent to protect from bugs or dirt on the ground. It fits just one person but leaves space for gear between the nest and outer shell. The gap also helps combat condensation. The interior nest provides ample space for a single camper to sleep and sit up, but not much more. I crawled into the mesh nest for the night and found plenty of room to unroll a sleeping pad and bag. Together, the tent and nest weigh 2lb., 5oz. Weather protection comes from the exterior shell that’s propped up by hiking poles and staked to the ground on four corners. The shell is giant for one person, and at 36-square-feet with steep walls, it is large enough for two campers and gear. It was easy to set up, but note it’s not free-standing — you must stake it out. This complicates camping where thin soil and rock compose the ground. 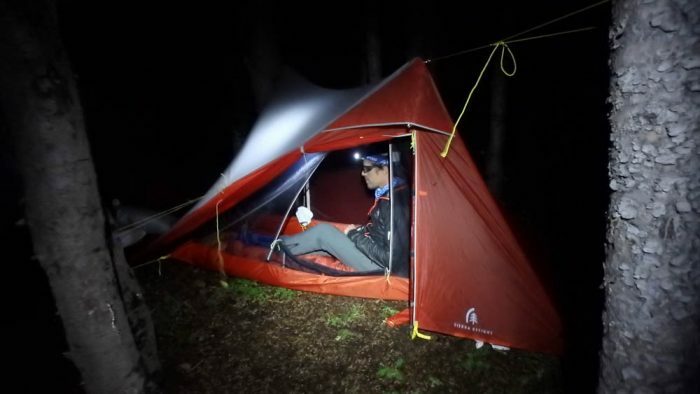 Skurka said the tent is suitable for harsh three-season use, and even moderate winter weather. Indeed, as winds whipped up in the night, the tent barely fluttered. The enclosed mesh net and floor hang easily inside the outer shell. With two doors and the ability to be used as a stand-alone bug shelter with trekking poles, the nest is a great option on hot summer nights when skies are fair but bugs are thick. Thanks to the large space between the outer shell and interior nest, the High Route vents like a dream. We had some rain during the night out, and everything stayed bone dry inside the tent. Condensation wasn’t an issue. Ultimately, this is a versatile shelter for a range of conditions. For anyone looking to move fast and light, but still in need of significant shelter from weather and insects, the High Route is a solid pick.